After being hanged for his crimes, 19th Century highwayman "Gentleman Jim" Craddock's spirit rose again - as the Gentleman Ghost. 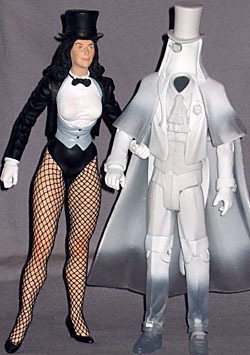 Returning to his former life of crime, the Gentleman Ghost soon crossed paths with the Justice Society of America. His powers and phantom nature make him nearly impossible to apprehend, but the heroes of the 21st Century have always managed to defeat this dapper, spectral villain. DC's got some pretty famous villains, but I'll wager this gent isn't the first name to spring to anyone's mind. Still, you can't argue with classic style, and as ghosts go, a spectral set of Victorian evening attire is right up there with a white sheet (and a lot less laughable besides). Like most apparitions, Gentleman Jim (at least in his original, pardon the pun, "incarnation"; his origin story got rewritten somewhat a few years back, but this being a DC Universe Classics figure, it's fair to assume he dates back to his debut days in the late 1940s) can only find eternal rest after those responsible for his murder (as, regardless of his life of crime in general, he was innocent of the specific act he was lynched for) have themselves passed on to the great beyond. Who're they? Hawkman and Hawkgirl, who thanks to their serial reincarnation will never pass on anywhere. Poor old Jim. Still, he's now got rather a spiffy action figure to his name, that should make him happy, right? Okay, probably not, but there's generally no pleasing ghosts. This is, though, a figure worth being pleased with - the Gentleman Ghost stands 7¼" tall to the top of his top hat, and there's not a great deal missing in all of that. 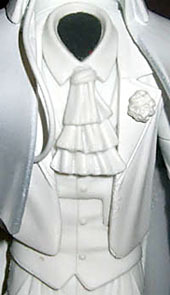 His tuxedo is reproduced in commendable detail, for a mass-market figure (especially in a line that, let's say, "isn't shy" about reusing the same muscular hero body over and over) - he's got the full deal of long trousers (appropriately creased around the ankles and waist), a buttoned shirt with a frilly cravat in the collar, and a formal tail coat, with a flower in the buttonhole no less. The feet are fully sculpted shoes with spats over them, and the hands have the backing ribs of formal gloves - Mattel hasn't cut corners. From about mid-shin the legs fade from white to transparent (apart from the inner discs of the ankle joints, which are visible but somewhat indistinct within their housings); the rest of the body is pure white without shading, but being white the body's shadows under normal room lighting pick out much of the detail. Jim sports an old-fashioned cloak, as well, which also fades from white to clear at its edges, both at the bottom of the main cape, and on the upper shoulder layer. 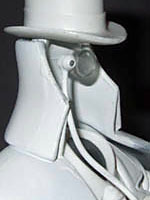 The cloak also solves Mattel's problem of how to manage the floating top hat on a guy with no head: they've extended the cloak's collar, taking advantage of the Victorian style for high collars, and then slanted the back of the collar up even higher so that the top hat can rest on it. The whole deal is plugged into the back, and isn't glued down elsewhere. It's not perfect - the back of the collar is quite thick, and if you look closely you realise it wouldn't leave room for a head even if Jim had one - but short of nitpicking it's a clever solution, and it looks much better than any sort of transparent plastic support would've. Jim's monocle is attached to the hat, with its cord then reaching down beneath the edge of the cloak. 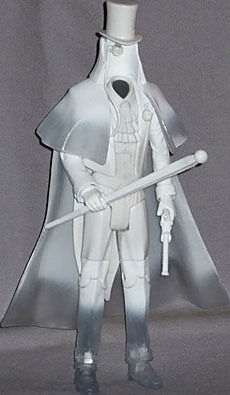 The cloak, for all its benefits in holding the hat up and just generally looking cool, does hamper mobility somewhat - it's soft plastic, and will flex fairly easily to allow the body underneath leeway (mainly the arms), but too much movement will likely cause it to stretch and not sit properly over the shoulders when the body is posed at rest. Obviously there's no neck joint - the interior of the shirt collar is painted a very dark brown (pure black would be too great a contrast) - so we're left with swivel/pin shoulders, swivel biceps, pin elbows, swivel wrists, a pin sternum, a swivel waist (restricted quite a lot by the edge of the shirt, I'd say only about 15° left or right), swivel/pin hips, swivel knee-tops, pin knees, and pin ankles. 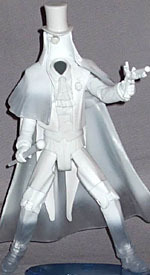 Among his various abilities, Gentleman Ghost can create ghostly weapons, and the figure includes two of his favourites, a cane (which he uses kind of like a wand, jets of ghost-flame and all that) and a flintlock pistol. Both are cast in plain white, and sculpted decently - the cane is quite plain, by design, but the pistol is pleasingly intricate. Jim's left hand is sculpted in a pistol grip, with trigger finger extended, and fits the flintlock perfectly; the right is a standard accessory grip, and holds the cane tightly. 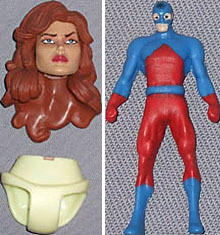 This series has Giganta as its Collect-And-Lament-That-"BAF"-Is-Trademarked figure, and Gentleman Ghost comes with two pieces, her head and what the packaging refers to as "lower torso". Let's be honest: underpants. Since they're not intended to be seen beneath Giganta's giant skirt (they're only a separate piece to make assembly easier) the hips, or whatever you want to call them, are very plain, but the head is sculpted and painted with a fair bit of finesse - with the BAFs being the lures to get customers to buy whole series, Mattel doesn't hold back on them. The set also has an unexpected bonus - an accessory for Giganta, in the form of a miniature Atom (Ray Palmer). He's only about an inch tall, so detail is necessarily limited - except for the atom symbol on his forehead, which is so tiny it just looks like a black blob to the naked eye, but is in fact meticulously exact. There's no articulation, but the sculpt is good for his size, and even manages to make him look particularly like his DCU stablemates, rather than just any old superhero figure. I recall seeing Gentleman Ghost once - when he got his intangible arse handed to him by Stargirl, since she's a virgin and ghosts can't harm virgins (I've seen some Stargirl/Cyclone altfic that'd solve that problem for him [HEY-O! --Ed.]) - but despite his relative obscurity, I'm quite taken with the figure. The paint job may not be greatly sophisticated, but it's more or less built into the character that it shouldn't be; his sculpt, clever collar design, articulation, accessories, and Atom all make him a solid winner. So to speak.